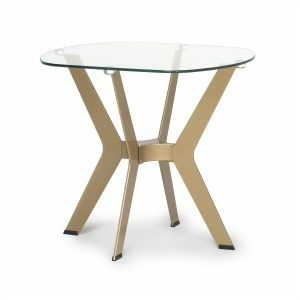 The contrasting materials, gold-tone metal, and glass make the ArchTech Coffee Table by Studio Designs Home an elegant and modern addition to your living room. The tempered glass top floats above the boomerang-shaped legs. The clear glass top is perfect for small spaces. The angled metal legs are powder coated to prevent scratching, the simple lines make this mid-century inspired coffee table the perfect addition to your living room. • Weight Limit: 40 lbs.